On this page you will find entry level information technology templates as well as templates. 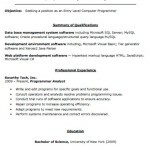 Click on an image to see a larger version of the resume and to visit the download page. Click on an image to view it at a larger size and be taken to the download page. Check back frequently as new resumes will be added often. 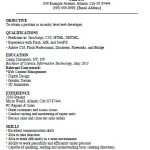 Click here to download the Entry Level Computer Programmer Resume. Click here to download the Entry Level Web Developer Resume. Resume templates should be used as guides to help you create a resume that highlights your unique combination of experience, skills and abilities. When editing resume templates, please be sure to personalize all information including: name, address, email, phone number, job titles, dates, qualifications and job duties. You do not want to have a resume that says the exact same thing as someone else. Resume templates, including tasks, qualifications, and skills, are meant as guidelines only and are not meant to replace your own personal experience. For more information on Information technology jobs, click here.